New Ivory Coast coach Sven-Goran Eriksson says his team cannot rely solely on the goals of star striker Didier Drogba at the World Cup. Eriksson named his provisional 30-man squad in Abidjan on Tuesday. 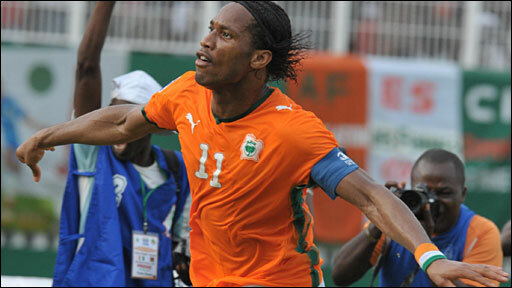 He said the African nation cannot expect too much from Drogba, the English Premier League's top scorer. Drogba, Chelsea team-mate Salomon Kalou, Barcelona's Yaya Toure, Aruna Dindane of Lens and defenders Emmanuel Eboue and Kolo Toure are all included. Do you have a photo with yourself and a star from Ivory Coast? Send us your photos to be in our World Cup Photo Album! "It's not enough to hope Drogba will go out and score goals," said Eriksson. The Swede has replaced Vahid Halilhodzic, and said there were "big expectations" for Ivory Coast at Africa's first World Cup. Goalkeepers: Vincent Angban (ASEC Abidjan), Boubacar Barry (Lokeren), Aristides Zogbo (Maccabi Netanya), Daniel Yeboah (ASEC Abidjan). Defenders: Souleymane Bamba (Hibernian), Arthur Boka (VfB Stuttgart), Benjamin Brou Angoua (Valenciennes), Guy Demel (Hamburg SV), Emmanuel Eboue (Arsenal), Abdoulaye Meite (West Bromwich Albion), Steve Gohouri (Wigan Athletic), Siaka Tiene (Valenciennes), Kolo Toure (Manchester City). Midfielders: Emerse Fae (Nantes), Jean-Jacques Gosso Gosso (Monaco), Abdelkader Keita (Galatasaray), Emmanuel Kone (International Curtea Arges), Gervais Yao Kouassi (Lille), Christian Koffi Ndri (Sevilla), Cheik Ismael Tiote (Twente Enschede), Yaya Toure (Barcelona), Gilles Yapi Yapo (Young Boys Berne), Didier Zokora (Sevilla). Forwards: Kanga Akale (Racing Lens), Aruna Dindane (Racing Lens), Seydou Doumbia (Young Boys Berne), Didier Drogba (Chelsea), Salomon Kalou (Chelsea), Bakary Kone (Olympique Marseille).